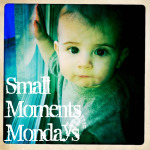 This week’s Small Moments Mondays guest poster is the lovely Nancy from Away We Go. Where do I begin to describe Nancy? My first introduction to her was through her writing for The Red Dress Club prompts. I have always been so excited to see her posts linked up. She is frugal with her words, yet she never comes up short; her posts are always…just perfect. What I love most about Nancy’s writing is that it isn’t overworked or overly sentimental, yet it often moves me to tears and leaves me thinking long after I’ve read it. Thank you, Nancy, for sharing this sweet story with us. I’m not sure I could have been so generous had this lovely story been mine. We were at a cookout with four other families, meaning that between us all, there were a dozen children playing in the backyard. My youngest son, true to form, had found a pile of dirt, and had settled into subterranean bliss. Some children had found the Princess costumes. Others kicked a soccer ball. And then there was my five-year old son–sitting on the deck, trying to get out of a marriage proposal. He stared straight ahead, his lips creased into a frown. “Okay. But I’ve already decided.” She skipped away, perhaps to read her tattered copy of Preschool Bride. His words flowed through me like honey on a warm biscuit. “You don’t have to.” I opened my mouth to say more, but then we heard the screaming. His little friend was hit in the eye with a ball. She wailed in her father’s arms. Her blond head heaved with each wave of shock and pain. He nodded, and marched from the deck to the grass. Without hesitation, he tapped her on the shoulder. She turned, sniffing and red-faced. Stepping forward, he enveloped her in a hug. They held each other briefly, and I heard him whisper, “It’ll be okay.” She wiped her eyes, and stepped back from the embrace. I watched from above, my eyes moist, my heart full. Although he did not understand marriage, he did understand how to be tender and kind. I wear this golden moment, dear and true, forever. I am so honored to share this moment. Thank you, Nichole, for the opportunity. You can also find her on Twitter, where she is funnier than she realizes. What a beautiful moment. So perfect for a mother's heart. Love this. Lovely as always, Nancy! What a kind boy you are raising. Oh Nancy what a gorgeous moment for you! Your son's heart is big and kind..that is the most wonderful thing to witness!!!! Happy Mother's Day!!!!! That's exactly it! It was a gift for me to see him do the right thing! I am so grateful that there are moments like this to counter the moments when I struggle. You too! We've always believed that kindness is the most important thing we can teach our boys…happy to see the lesson is starting to stick! Nichole, thank you so much for allowing me to share this moment. Your words touched me, and I am grateful to share this space with you. So beautiful Nancy, what a perfect moment. There is nothing better than to know that we are raising kind children and that our boys love us more than any other girl in the world :). Ahhhh, Nancy this is so sweet! What an adorable little boy. I can't imagine how proud you were that he didn't break the little girl's spirit. I'm childless for the time being, but I feel so lucky that when we do have a child, he or she will have the gentle example of my husband to follow. I want to raise smart, funny, outgoing children… but most of all, I want them to be kind. Also, I know a good piece when I repeat it to people throughout the day. I will be telling this story all week. Ooops, I forgot to subscribe to replies, so here I am again. And now I'm a blubbering mess. I often get so frustrated with how this world of ours stereotypes little boys – yes they're rough and tumble and can't resist a pile of dirt (amen), but they do have a sensitive side that is like Heaven on Earth. A wise mother nurtures and tends it, as she embraces all the other fun. Thank you, thank you for being a wise mother. If I had a daughter, that other chick would have to step aside. Oh honey- I'm teary! TEARY! This was gorgeous, beautiful, and tender. Little boys proposing to their mothers always makes me swoon. So sweet. You've obviously raised a sweet young man there. He'll make a great husband someday. What a sweet, kind hearted boy! Well done, Mom! aaaannnd, the pregnancy hormones overfloweth. Strinkingly beautiful. ANd Nichole's right—you are frugal with your words, but always manage to say so much. Love that little Owen. And you. I pray all the time that my sons will never want to leave me. Well until I'm ready that is. What a sweet boy you have. Oh Nancy, this is so sweet! I can picture that scene, those tender words and that sweet hug. You are obviously doing something right as a mom, for such a thoughtful little boy you have there. Yes! Paul and I want kindness more than anything. And I think my last challenge will be letting other girls love my boys and letting them go. Thanks, Jen. Gentleness is so, so important. You can be strong, but you can still notice pain and work to fix it. I think you will raise amazing kids, when the time is right. I love this. It's true. People think it's all about wrestling and dirt. And yes, some of it is. But there's also those hugs with little dirty hands and sweet, sweaty heads. That's EXACTLY what I was thinking! I'm here! I get to see this! On my good days, yes. On my not so good day? I'm glad the boys have a good father. I hope so. And I hope I'm a good mother-in-law. I am very blessed and grateful. I think my cheapness extends even to my writing. I save words for rainy days! I get that. Don't leave until you really need to leave to stay happy. But call. Often. Thanks, Sherri! We are very very proud of him. And we work on it a lot because he doesn't always extend such kindness to his own brother! Eyes misting up……warm fuzzies in the belly. Love this! You rock Nancy. What a sweet boy you have. One day a woman out there will be very lucky to have him! That is an amazing moment, one to cherish and be proud of. Owen is going to make a wonderful husband someday! Nancy, this is absolutely beautiful. This is what I hope to teach my son: tenderness and kindness. What a wonderful boy you are raising, momma! Oh… this made me cry. I can only hope that I'm raising my son to be so kind and thoughtful. So sweet. So well done by Nancy, as always! Nancy rocks. That is all. I am late to the party, but the impact isn't lessened. What a tender moment. And I love that he just wants to marry you.